Active Ingredient: AGRYLIN® Capsules contain either 0.5 mg or 1 mg of anagrelide base (as anagrelide hydrochloride). Inactive Ingredients: Anhydrous Lactose NF, Crospovidone NF, Lactose Monohydrate NF, Magnesium stearate NF, Microcrystalline cellulose NF, Povidone USP. Chemical Name: 6,7-dichloro-1,5-dihydroimidazo[2,1-b]quinazolin-2(3H)-one monohydrochloride monohydrate. Following oral administration of 14 C-anagrelide in people, more than 70% of radioactivity was recovered in urine. Based on limited data, there appears to be a trend toward dose linearity between doses of 0.5 mg and 2.0 mg. At fasting and at a dose of 0.5 mg of anagrelide, the plasma half-life is 1.3 hours. The available plasma concentration time data at steady state in patients showed that anagrelide does not accumulate in plasma after repeated administration. Two major metabolites have been identified (RL603 and 3-hydroxy anagrelide). There were no apparent differences between patient groups (pediatric versus adult patients) for t max and t 1/2 for anagrelide, 3-hydroxy anagrelide, or RL603. Pharmacokinetic data obtained from healthy volunteers comparing the pharmacokinetics of anagrelide in the fed and fasted states showed that administration of a 1 mg dose of anagrelide with food decreased the C max by 14%, but increased the AUC by 20%. Pharmacokinetic (PK) data from pediatric (age range 7-14 years) and adult (age range 16-86 years) patients with thrombocythemia secondary to a myeloproliferative disorder (MPD), indicate that dose and body weight-normalized exposure, C max and AUC t , of anagrelide were lower in the pediatric patients compared to the adult patients (C max 48%, AUC t 55%). A pharmacokinetic study at a single dose of 1 mg anagrelide in subjects with severe renal impairment (creatinine clearance <30ml/min) showed no significant effects on the pharmacokinetics of anagrelide. A pharmacokinetic study at a single dose of 1 mg anagrelide in subjects with moderate hepatic impairment showed an 8-fold increase in total exposure (AUC) to anagrelide.  Nine hundred and forty-two subjects with myeloproliferative disorders were enrolled in three research studies. Of these, 923 had platelet counts over the duration of the studies. AGRYLIN® was effective in phlebotomized patients as well as in patients treated with other concomitant therapies including hydroxyurea, aspirin, interferon, radioactive phosphorus, and alkylating agents. AGRYLIN® Capsules are indicated for the treatment of patients with thrombocythemia, secondary to myeloproliferative disorders, to reduce the elevated platelet count and the risk of thrombosis and to ameliorate associated symptoms including thrombo-hemorrhagic events (see CLINICAL STUDIES , DOSAGE and ADMINISTRATION ). Anagrelide is contraindicated in patients with severe hepatic impairment. Exposure to anagrelide is increased 8-fold in patients with moderate hepatic impairment (See CLINICAL PHARMACOLOGY ). Use of anagrelide in patients with severe hepatic impairment has not been studied. (See also WARNINGS : Hepatic Impairment ). Exposure to anagrelide is increased 8-fold in patients with moderate hepatic impairment (See CLINICAL PHARMACOLOGY ). Use of anagrelide in patients with severe hepatic impairment has not been studied. The potential risks and benefits of anagrelide therapy in a patient with mild and moderate impairment of hepatic function should be assessed before treatment is commenced. In patients with moderate hepatic impairment, dose reduction is required and patients should be carefully monitored for cardiovascular effects (See DOSAGE AND ADMINISTRATION for specific dosing recommendations). Laboratory Tests: Anagrelide therapy requires close clinical supervision of the patient. While the platelet count is being lowered (usually during the first two weeks of treatment), blood counts (hemoglobin, white blood cells), liver function (SGOT, SGPT) and renal function (serum creatinine, BUN) should be monitored. In 9 subjects receiving a single 5 mg dose of anagrelide, standing blood pressure fell an average of 22/15 mm Hg, usually accompanied by dizziness. Only minimal changes in blood pressure were observed following a dose of 2 mg.
Cessation of AGRYLIN® Treatment: In general, interruption of anagrelide treatment is followed by an increase in platelet count. 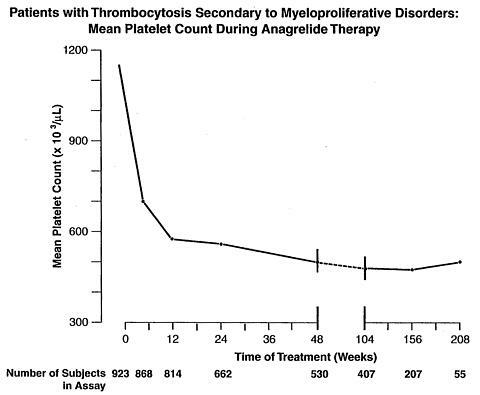 After sudden stoppage of anagrelide therapy, the increase in platelet count can be observed within four days. Drug Interactions: Limited PK and/or PD studies investigating possible interactions between anagrelide and other medicinal products have been conducted. In vivo interaction studies in humans have demonstrated that digoxin and warfarin do not affect the PK properties of anagrelide, nor does anagrelide affect the PK properties of digoxin or warfarin. An in vivo interaction study in humans demonstrated that a single 1mg dose of anagrelide administered concomitantly with a single 900 mg dose of aspirin was generally well tolerated. There was no effect on bleeding time, PT or aPTT. No clinically relevant pharmacokinetic interactions between anagrelide and acetylsalicylic acid were observed. In that same study, aspirin alone produced a marked inhibition in platelet aggregation ex vivo . Anagrelide alone had no effect on platelet aggregation, but did slightly enhance the inhibition of platelet aggregation by aspirin. Anagrelide is metabolized at least in part by CYP1A2. It is known that CYP1A2 is inhibited by several medicinal products, including fluvoxamine, and such medicinal products could theoretically adversely influence the clearance of anagrelide. Anagrelide demonstrates some limited inhibitory activity towards CYP1A2 which may present a theoretical potential for interaction with other co-administered medicinal products sharing that clearance mechanism e.g. theophylline. Carcinogenesis, Mutagenesis, Impairment of Fertility: No long-term studies in animals have been performed to evaluate carcinogenic potential of anagrelide hydrochloride. Anagrelide hydrochloride was not genotoxic in the Ames test, the mouse lymphoma cell (L5178Y, TK +/- ) forward mutation test, the human lymphocyte chromosome aberration test, or the mouse micronucleus test. Anagrelide hydrochloride at oral doses up to 240 mg/kg/day (1,440 mg/m 2 /day, 195 times the recommended maximum human dose based on body surface area) was found to have no effect on fertility and reproductive performance of male rats. However, in female rats, at oral doses of 60 mg/kg/day (360 mg/m 2 /day, 49 times the recommended maximum human dose based on body surface area) or higher, it disrupted implantation when administered in early pregnancy and retarded or blocked parturition when administered in late pregnancy. Teratology studies have been performed in pregnant rats at oral doses up to 900 mg/kg/day (5,400 mg/m 2 /day, 730 times the recommended maximum human dose based on body surface area) and in pregnant rabbits at oral doses up to 20 mg/kg/day (240 mg/m 2 /day, 32 times the recommended maximum human dose based on body surface area) and have revealed no evidence of impaired fertility or harm to the fetus due to anagrelide hydrochloride. A fertility and reproductive performance study performed in female rats revealed that anagrelide hydrochloride at oral doses of 60 mg/kg/day (360 mg/m 2 /day, 49 times the recommended maximum human dose based on body surface area) or higher disrupted implantation and exerted adverse effect on embryo/fetal survival. A perinatal and postnatal study performed in female rats revealed that anagrelide hydrochloride at oral doses of 60 mg/kg/day (360 mg/m 2 /day, 49 times the recommended maximum human dose based on body surface area) or higher produced delay or blockage of parturition, deaths of nondelivering pregnant dams and their fully developed fetuses, and increased mortality in the pups born. Five women became pregnant while on anagrelide treatment at doses of 1 to 4 mg/day. Treatment was stopped as soon as it was realized that they were pregnant. All delivered normal, healthy babies. There are no adequate and well-controlled studies in pregnant women. Anagrelide hydrochloride should be used during pregnancy only if the potential benefit justifies the potential risk to the fetus. Anagrelide is not recommended in women who are or may become pregnant. If this drug is used during pregnancy, or if the patient becomes pregnant while taking this drug, the patient should be apprised of the potential harm to the fetus. Women of child-bearing potential should be instructed that they must not be pregnant and that they should use contraception while taking anagrelide. Anagrelide may cause fetal harm when administered to a pregnant woman. Nursing Mothers: It is not known whether this drug is excreted in human milk. Because many drugs are excreted in human milk and because of the potential for serious adverse reaction in nursing infants from anagrelide hydrochloride, a decision should be made whether to discontinue nursing or to discontinue the drug, taking into account the importance of the drug to the mother. Pediatric Use: Myeloproliferative disorders are uncommon in pediatric patients and limited data are available in this population. An open label safety and PK/PD study (See Clinical Pharmacology section) was conducted in 17 pediatric patients 7-14 years of age (8 patients 7-11 years of age and 9 patients 11-14 years of age, mean age of 11 years; 8 males and 9 females) with thrombocythemia secondary to ET as compared to 18 adult patients (mean age of 63 years, 9 males and 9 females). Prior to entry on to the study, 16 of 17 pediatric patients and 13 of 18 adult patients had received anagrelide treatment for an average of 2 years. The median starting total daily dose, determined by retrospective chart review, for pediatric and adult ET patients who had received anagrelide prior to study entry was 1mg for each of the three age groups (7-11 and 11-14 year old patients and adults). The starting dose for 6 anagrelide-naive patients at study entry was 0.5mg once daily. At study completion, the median total daily maintenance doses were similar across age groups, median of 1.75mg for patients of 7-11 years of age, 2mg in patients 11-14 years of age, and 1.5mg for adults. The study evaluated the pharmacokinetic (PK) and pharmacodynamic (PD) profile of anagrelide, including platelet counts (See Clinical Pharmacology section). The frequency of adverse events observed in pediatric patients was similar to adult patients. The most common adverse events observed in pediatric patients were fever, epistaxis, headache, and fatigue during a 3-months treatment of anagrelide in the study. 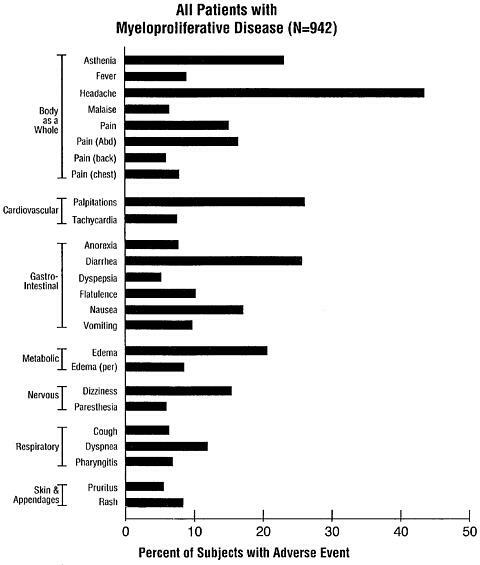 Adverse events that had been reported in these pediatric patients prior to the study and were considered to be related to anagrelide treatment based on retrospective review were palpitation, headache, nausea, vomiting, abdominal pain, back pain, anorexia, fatigue, and muscle cramps. Episodes of increased pulse rate and decreased systolic or diastolic blood pressure beyond the normal ranges in the absence of clinical symptoms were observed in some patients. Reported AEs were consistent with the known pharmacological profile of anagrelide and the underlying disease. There were no apparent trends or differences in the types of adverse events observed between the pediatric patients compared with those of the adult patients. No overall difference in dosing and safety were observed between pediatric and adult patients. In another open-label study, anagrelide had been used successfully in 12 pediatric patients (age range 6.8 to 17.4 years; 6 male and 6 female), including 8 patients with ET, 2 patients with CML, 1 patient with PV, and 1 patient with OMPD. Patients were started on therapy with 0.5 mg qid up to a maximum daily dose of 10 mg. The median duration of treatment was 18.1 months with a range of 3.1 to 92 months. Three patients received treatment for greater than three years. Other adverse events reported in spontaneous reports and literature reviews include anemia, cutaneous photosensitivity and elevated leukocyte count. Geriatric Use: Of the total number of subjects in clinical studies of AGRYLIN® , 42.1% were 65 years and over, while 14.9% were 75 years and over. No overall differences in safety or effectiveness were observed between these subjects and younger subjects, and other reported clinical experience has not identified differences in response between the elderly and younger patients, but greater sensitivity of some older individuals cannot be ruled out. Analysis of the adverse events in a population consisting of 942 patients in 3 clinical studies diagnosed with myeloproliferataive diseases of varying etiology (ET: 551; PV: 117; OMPD: 274) has shown that all disease groups have the same adverse event profile. While most reported adverse events during anagrelide therapy have been mild in intensity and have decreased in frequency with continued therapy, serious adverse events were reported in these patients. These include the following: congestive heart failure, myocardial infarction, cardiomyopathy, cardiomegaly, complete heart block, atrial fibrillation, cerebrovascular accident, pericarditis, pericardial effusion, pleural effusion, pulmonary infiltrates, pulmonary fibrosis, pulmonary hypertension, pancreatitis, gastric/duodenal ulceration, and seizure. Hemic & Lymphatic System: Anemia, thrombocytopenia, ecchymosis, lymphadenopathy. Renal abnormalities occurred in 15 patients (ET: 10; PV: 4; OMPD: 1). Six ET, 4 PV and 1 with OMPD experienced renal failure (approximately 1%) while on anagrelide treatment; in 4 cases, the renal failure was considered to be possibly related to anagrelide treatment. The remaining 11 were found to have pre-existing renal impairment. Doses ranged from 1.5-6.0 mg/day, with exposure periods of 2 to 12 months. No dose adjustment was required because of renal insufficiency. Treatment with AGRYLIN® Capsules should be initiated under close medical supervision. The recommended starting dosage of AGRYLIN® for adult patients is 0.5 mg qid or 1 mg bid, which should be maintained for at least one week. Starting doses in pediatric patients have ranged from 0.5 mg per day to 0.5 mg qid. As there are limited data on the appropriate starting dose for pediatric patients, an initial dose of 0.5 mg per day is recommended. In both adult and pediatric patients, dosage should then be adjusted to the lowest effective dosage required to reduce and maintain platelet count below 600,000/µL, and ideally to the normal range. The dosage should be increased by not more than 0.5 mg/day in any one week. Maintenance dosing is not expected to be different between adult and pediatric patients. Dosage should not exceed 10 mg/day or 2.5 mg in a single dose (see PRECAUTIONS ). It is recommended that patients with moderate hepatic impairment start anagrelide therapy at a dose of 0.5mg/day and be maintained for a minimum of one week with careful monitoring of cardiovascular effects. The dosage increment must not exceed more than 0.5mg/day in any one-week. The potential risks and benefits of anagrelide therapy in a patient with mild and moderate impairment of hepatic function should be assessed before treatment is commenced. Use of anagrelide in patients with severe hepatic impair-ment has not been studied. Use of anagrelide in patients with severe hepatic impairment is contraindicated (See CONTRAINDICATIONS ). Typically, platelet count begins to respond within 7 to 14 days at the proper dosage. The time to complete response, defined as platelet count </= 600,000/µL, ranged from 4 to 12 weeks. Most patients will experience an adequate response at a dose of 1.5 to 3.0 mg/day. Patients with known or suspected heart disease, renal insufficiency, or hepatic dysfunction should be monitored closely. 0.5 mg, opaque, white capsules imprinted "
1 mg, opaque, gray capsules imprinted "
Store at 25°C (77°F) excursions permitted to 15-30°C(59-86°F), [See USP Controlled Room Temperature]. Store in a light resistant container. © 2004 Shire Us Inc.